Ships Log, May 13, 2014. Yesterday was summer but today bursts the illusion of spring. Seasons run backwards, the rivers fill will blood. Croaking frogs fall from the sky. Cracks appear in the caterpillars that dangle on chalky white web from scarred dead trees. 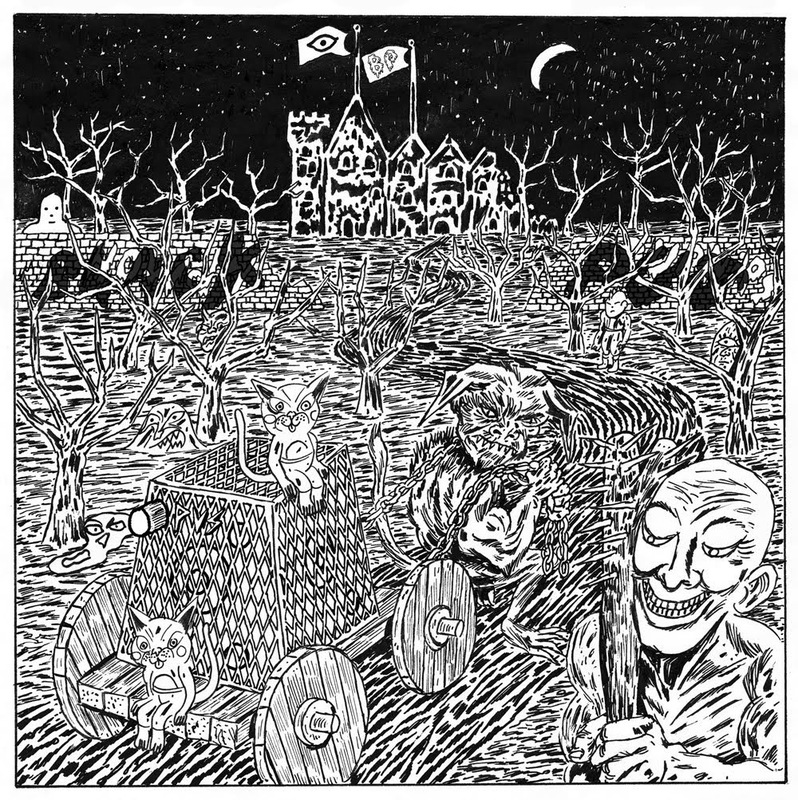 Worse yet, a new Black Pus song "Blood Will Run" popped up on a few music sites. It's the easy listening song off my upcoming split LP with Oozing Wound, a song that casually references the senseless killing of Florida teen Jordan Davis. The as of yet unheard second song off my side of the LP, "Total Eclipse", is a 14 minute Kraut rock noise sprawl that balances out the pop of this first track. They work together. Pre Order the 12" split here. It's already got a review at No Dice Mag, which google translate tells us goes something like this "a snare drum that sounds like person and a simple but effective game" or "both pleasurable madness as completely unsustainable" and in closure "Anyway, when you know a snowman behind it , it is actually not more surprised than minimum it and say the same : ' to piss off the neighbors, this is downright good!'". Thanks for that!!!! 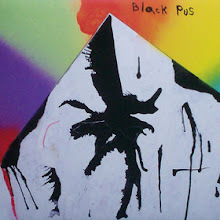 Look for Black Pus in a European city near you in a couple months! ALSO. 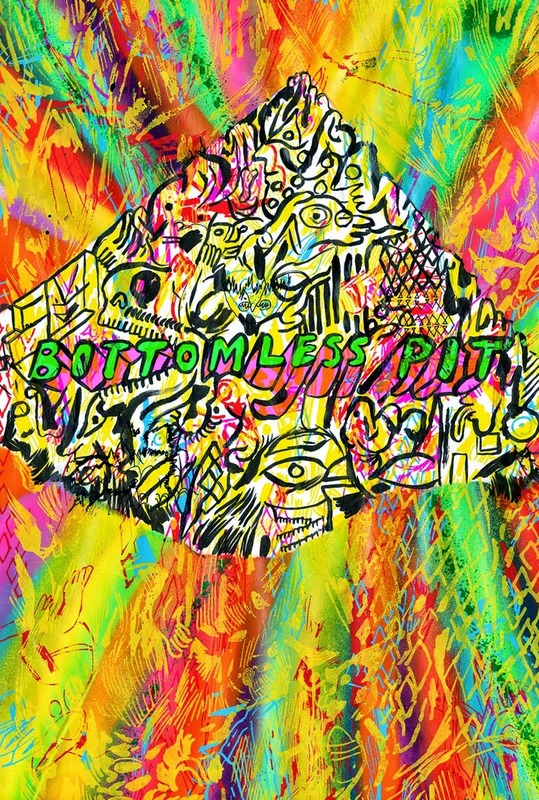 MY SILKSCREEN PRINT STORE "THE BOTTOMLESS PIT" IS NOW IN FULL EFFECT. HANDMADE LIMITED EDITION WHAT HAVE YOU. I HAVE STURDY CARDBOARD MAILING TUBES AND I KNOW HOW TO USE THEM. 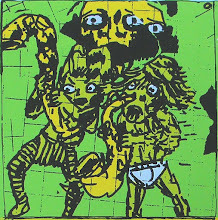 BRIAN CHIPPENDALE AT STORENVY! ALSO. I recently received a secret handshake that lead me to this perfect drawing spaced out soundtrack music; PSYCHIC MOLD. Also,(oh how i love ALSO), i uncovered some past ships logs when i started in on this new entry. Ships Log, March 15, 2014. Winter is keeping it's grip on Providence Rhode Island. In a few days I'll jump on an airplane keeping my fingers crossed that i don't end up like Malaysia Air Flight 370 and disappear into oblivion somewhere off the coast of New Jersey. This destination is Mexico City for a one off show as part of the Aural festival. One off shows are great if they are low profile ordeals in a party basement or grimy mill in New England, but more high profile one off shows make me nervous. I like to hit high profile shows while I'm in the midst of a tour and "in the mode". There is nothing like tour mode for a musician. You can cut like a knife. It feels great to feel proficient. But, when a Mexico City offer comes up in March and you can escape the 20F weather you best take it. So away I go. If i am lucky I'll be able to get a piece of the furious power i had going on in this video from last autumns European tour. I love this video which was kind of a jam i was developing over the course of the tour, reached a peak with this show. 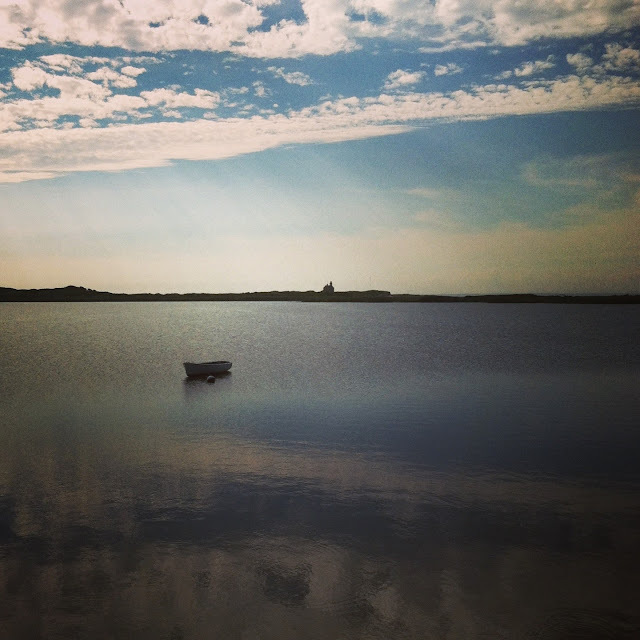 Ships Log, September 2013. I haven't printed a silkscreen LP cover in quite some time. Let's see, there was 750 copies of Lightning Bolt's "Yellow Album"back in '98. i think that was 4 colors. Then there was Ride the Skies around the turn of the century which i did 1000 copies of (5 color cover) and then printed another 300 later. That sucked. Then I printed 3 copies of Wonderful Rainbow, just enough to get one right so we could photograph it or scan it to produce the regular LP covers. That had very many colors. maybe a dozen? I did a couple seven inches but those are small and you do a lot at a time so no big deal. 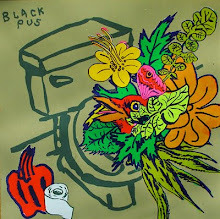 And now it's Black Pus. 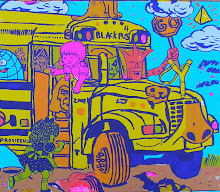 Black Pus Zero, Ultimate Beat Off to be exact. 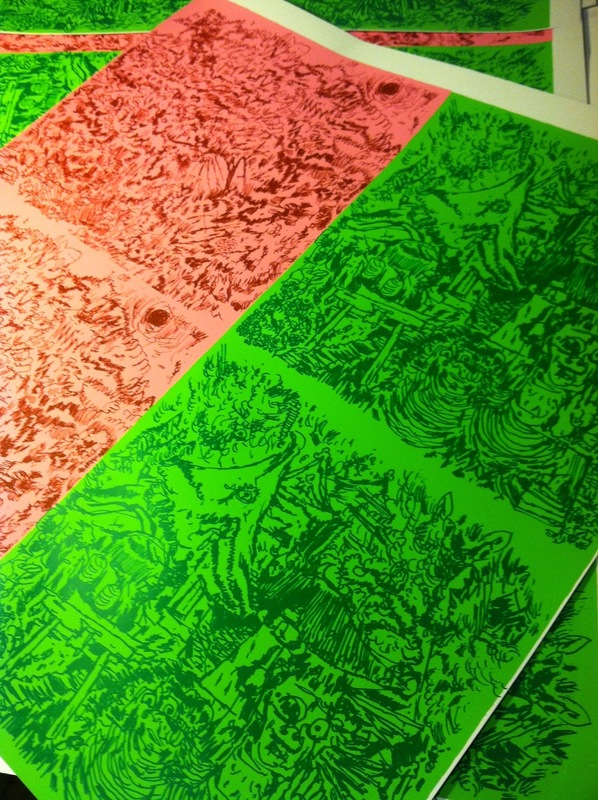 500 copies at 6 colors a copy. Enough to make the legs a crickity. crackity. crumpility. crampitility. I was dreading the job which made it very easy to find things to get in its way but i finally finally knocked out a bunch of them. Track one down, put it on your turntable, and perhaps it will knock out a bunch of you as well. "you probably saw this post yesterday or chose not to see it as you will choose not to see it today or you will just never see it because seeing a FaceBook post (I call all posts everywhere Facebook posts even in fences and under signs) in a wash of FB posts is like catching the eye of a drop of rain and peering into it's soul." It's been a big year for travel. So much so that i don't always remember where I am, what time it is or what I should be doing. Travel for me has included a month long Black Pus U.S tour, a trip to the Emirate of Sharjah in the UAE to play drums in the streets around an art fair, a week in Japan as drummer number 91 in the latest installment of the Boredom's Boadrum. I even got a chance to linger on the beaches of Block Island, a sweet little (real)island off the coast of Rhode (not really an)Island. And the travel won't be ending anytime soon. 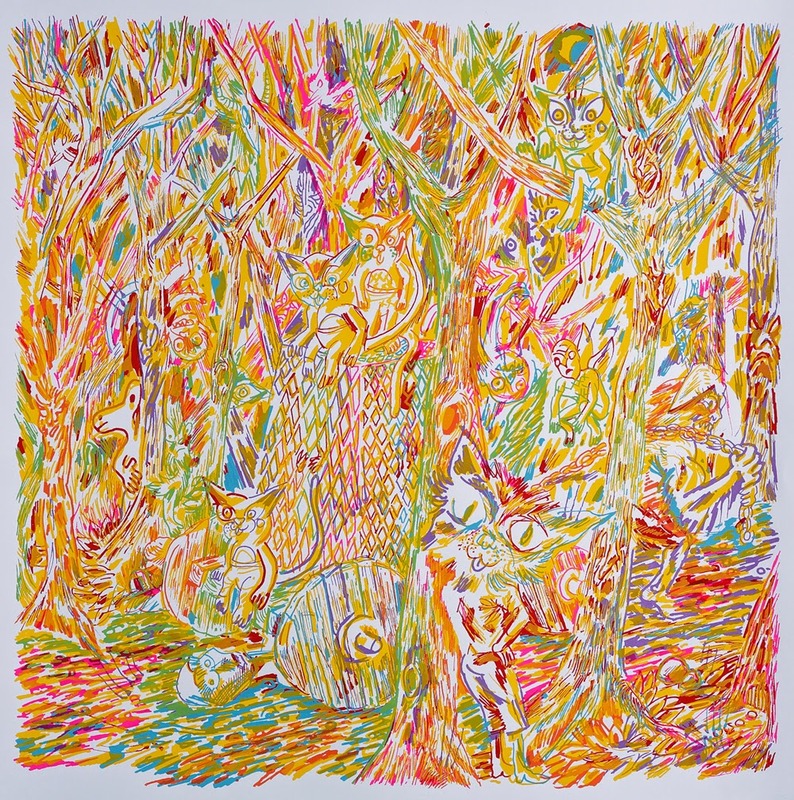 Coming up is a 22 date Black Pus Europe/UK tour starting in September and then Lightning Bolt hits New Zealand and Australia for a tour and an appearance at ATP in late October early November. Here's a quick return to Japan to see Lone Wolf aka Ryan Sawyer play a bit of a solo set. Devo. Where was I. Oh but the Japan trip was a great time. 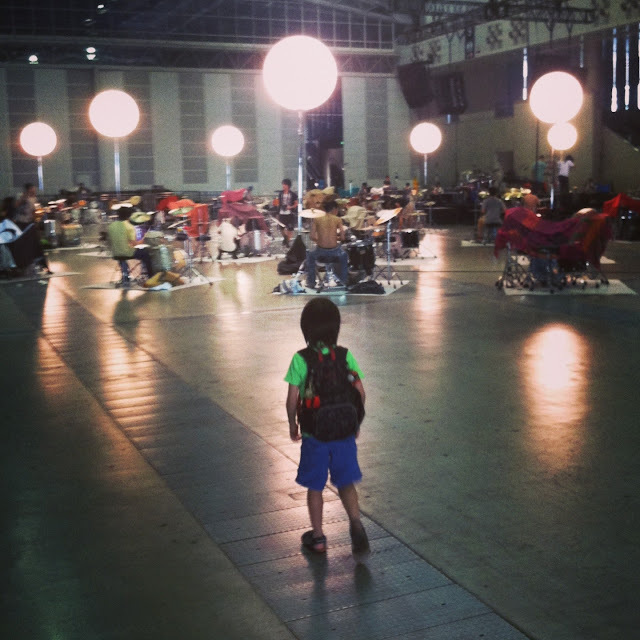 The Boredoms remain true heroes. 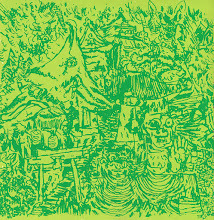 A remnant of the US tour, here is Black Pus's June 9th live set on Thomas Storck's Dangerous for the Brain show on WFMU engineered by Ernie Indradat. Lightning Bolt has a new song out for Adults Swim's summer music series that you can download by clicking here! Barbarian Boy! 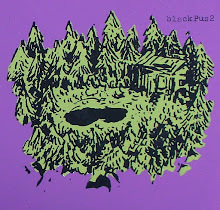 Next it's an unreleased Black Pus track from a few years back, "Down by the Stream"
Black Pus also has a new song "Pay My Billz" recorded at Machine with Magnets(same studio Barbarian Boy was done) released on the Esopus Magazine compilation from issue 19. Both songs feature a HiHat! 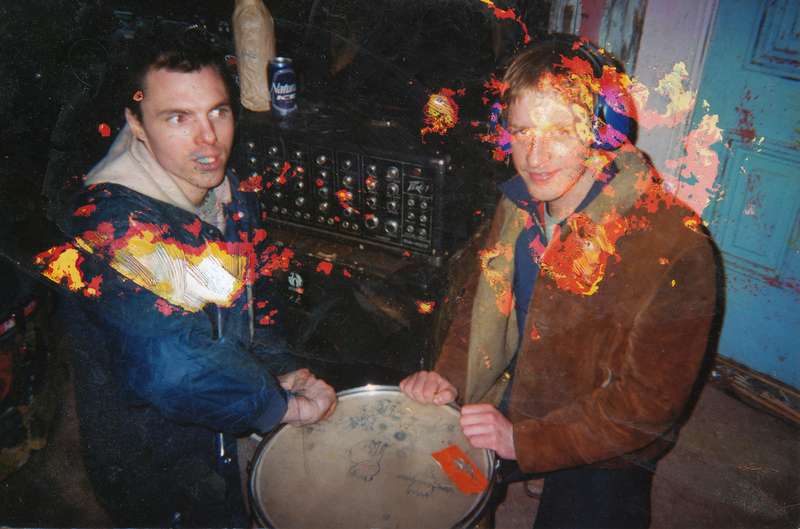 Machines with Magnets also recently finished recording an album for Humanbeast, a providence duo who's LP "Venus Ejaculates into the Banquet" just came out on Load records. This song "chandelier" features some ssssssssick screams by singer Maralie Armstrong! Videos. 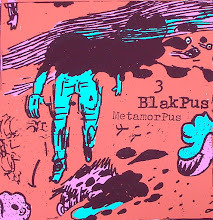 Black Pus was lucky enough to have Carlos Montaña film a video for Primordial Pus's "Hole in the Ground". You can get that record and others through Forced Exposure. I like this song, and video. Huge thanks to Carlos for making this. a raging version of Neuronic Knife in San Diego. I love this video. I rolled into San Diego fighting a fever after two sweaty days in LA and luckily found some delicious Pho to steam some of the germs out. I highly recommend Tao Restaurant. I only went once but the food was great and when the owner overheard I was sick he gave me a free large fresh squeezed orange juice. Guy was super nice and the walls had crazy scribbles all over them. Here is one of the LA nights that helped get me sick! 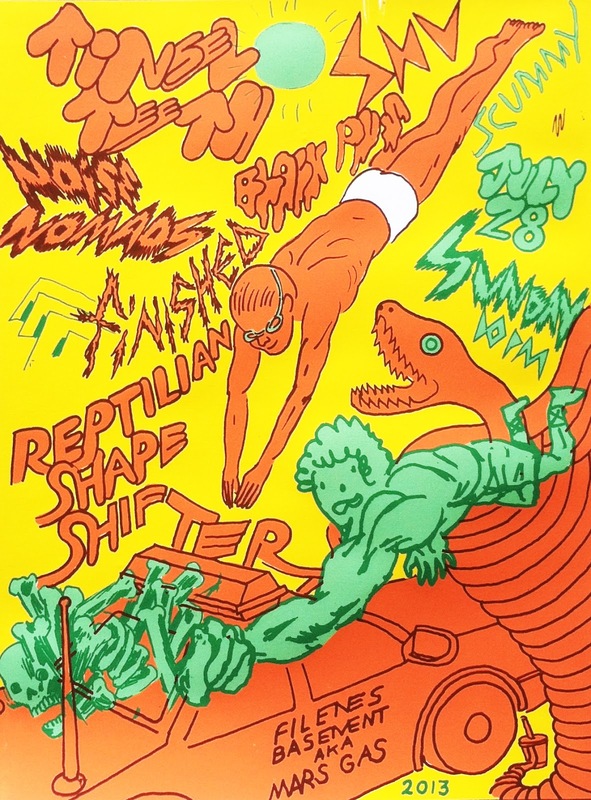 Full Set at The Smell! 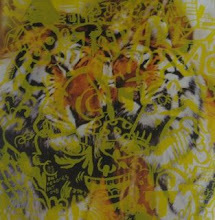 also some silkscreens i made like this one below are available for sale at picturebox! 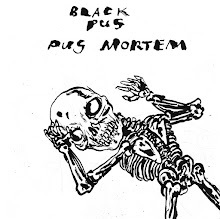 NEW DIGITAL ALBUM, "PUS MORTEM"! 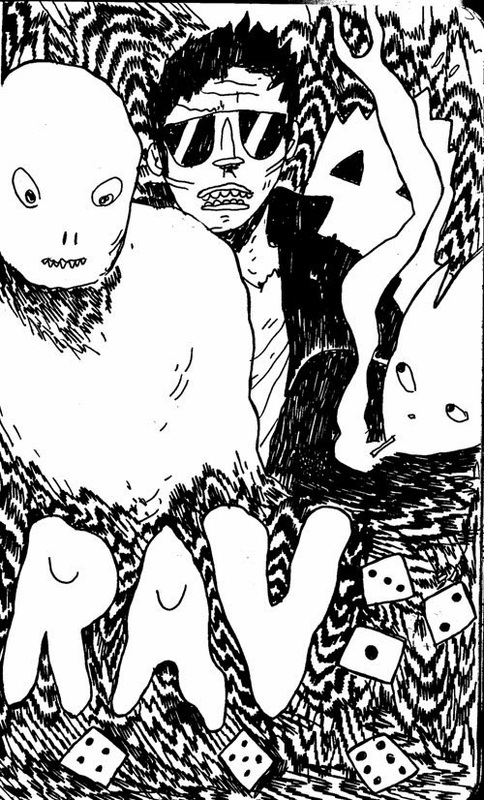 SCROLL DOWN TO SEE BLACK PUS 1 CD FACE DRAWINGS. NEW CD DRAWINGS WILL BE STUCK INTO THE POSTS AS THE PUS FLOWS.